Almost every traveler wishes a tour of a foreign country to be a golden opportunity to learn not only about its culture and history but also to experience the delights of the local food and comfortable transportations and other amenities to ensure a completely stress-free holiday. This is particularly true of travelers to P. R. China. Our private tours with Travel China Guide are designed to make your wishes come true! 1. We offer two bottles of mineral water per person per day free of charge. 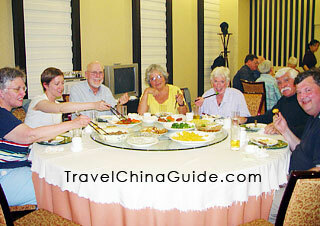 Travel China Guide also suggests other travel agencies do likewise in the interest of all the inbound tourists. 2. We arrange air-conditioned vehicles in excellent conditions, clean and commodious. Please compare the car or the van the other travelers use. It's different! 3. For where possible, we offer at least one or two A La Carte chances for you to order real Chinese dishes at fancy restaurants for yourselves! Our take-with menus will make the order process easily and leisurely! The mass produced food suppliers - appointed tourist restaurants are all kept away from TCG's clients. For every lunch and dinner we offer two cups of soft drink or local beer instead of only one as one of the set rules of other travel agencies in China! 1. For the first lunch in Beijing, we will arrange an a la carte lunch at a decent restaurant, where you may order the dishes as you wish from our specially-made menus, you can also choose the famous Peking duck and we believe it will delight your first impression on Beijing. 2. We arrange another a la carte lunch in Beijing at a fancy restaurant, where you can not only experience the diversified Chinese cuisine, but also get close touch with the local people's dining custom. 3. For Chinese Kungfu Show at the Red Theatre we specially arrange for you is a unique theatrical production which celebrates the philosophy and skill of the martial art of Kung Fu through story-line, dramatic design, choreography and breath-taking music. It is surely one of the most spectacular events in Beijing. 1. A la carte Chinese menus for all lunches and dinners. Please study our menu. It is our practice to select local fancy restaurants that are clean and well known for the excellence of their dishes. We shun appointed tourist restaurants that serve mass-produced food for travelers. 2. For lunch on the day tour to the Terracotta Warriors and Horses Museum, we find a highly reputable local restaurant for you to have an a la carte meal to make sure you can be certain of a real treat after this energy-required site. 3. A local family visit allows you to have a close contact with the Chinese family, be familiar with their living environment and daily life situation. Which we believe will make you know more about Chinese culture and tradition nowadays. And the hostess's hospitality and the home-cooked dishes will surely delight your whole tour. 4. We recommend the wonderful Tang Dynasty Dance and Music Show. Prior to the show, we specially arrange the local specialty, Dumpling dinner for the clients. 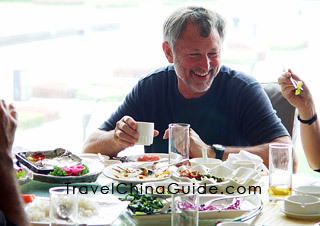 Being one of the famous cruises in China, Shanghai cuisine is the one that you can not miss. We arrange an a la carte lunch for our clients at a very good restaurant, which has earned its reputation for good food over the past years and is considered the best place to sample Shanghai Cuisine, renowned for its rich sauces and original flavors. DIFFERENCES CAN BE ONLY MADE BY COMPARISON. Travel China Guide is eager to offer top level services for our valued guests. It is the special attention paid to details that make one tour preferable to another and we suggest you consider the extra benefits and values we offer over and above those on tours available from other operators. We welcome suggestions and comparison as to ways in which we can further improve our tours. Meeting your need is our top priority. Thank you for considering Travel China Guide and we warmly invite you to join us for a truly unforgettable experience! I am from Sydney, Australia and am a bit wary of using an online service. Would someone from Sydney, Australia please give me your telephone number so that I can verify the credential of this company? Hi, you may check the feedback column to see the reviews written by the former clients. You can also drop an email to some of them to get ideas if you want. I have used this agency several times since I moved to China last November. They are quick courteous, genuine and honest/respectable. They will even help you to save money when you can and return monies to your bank account quite quickly if over charged for anything. This is one of the best places to get any sort of travel information and they have some of the best prices around. On next few days, my boss will fly to Guangzhou city and have business in Dongguan City. He is Korean, he needs an interpreter on English and Chinese language within the time he is there (around 3 days). Can your company supply such interpreter for him? Pls feedback a.s.a.p. Tks. I had the same enquiry with you. They don't provide this kind of service. Hi gilboy, I just returned home after my 14 days visit including yangtze also. Wow, so fabulous! Our New Century ship was amazing, very luxurious. They have beauty salon and business center on the ship, so it can definitely meet your needs. I think most ships are with these kind of service, take it easy.